This book written in collaboration between a Historian, John Dixon, and a Town Planner, Toby Clempson. The concept was born by the Historian's desire to see, and the Town Planner's willingness to share, the real photographs - instead of ghostly copies - of the buildings which graced the Upper High Street before the building of the new shopping area, which locals refer to as the "Kremlin". We argue that this epithet does the Kremlin an injustice! 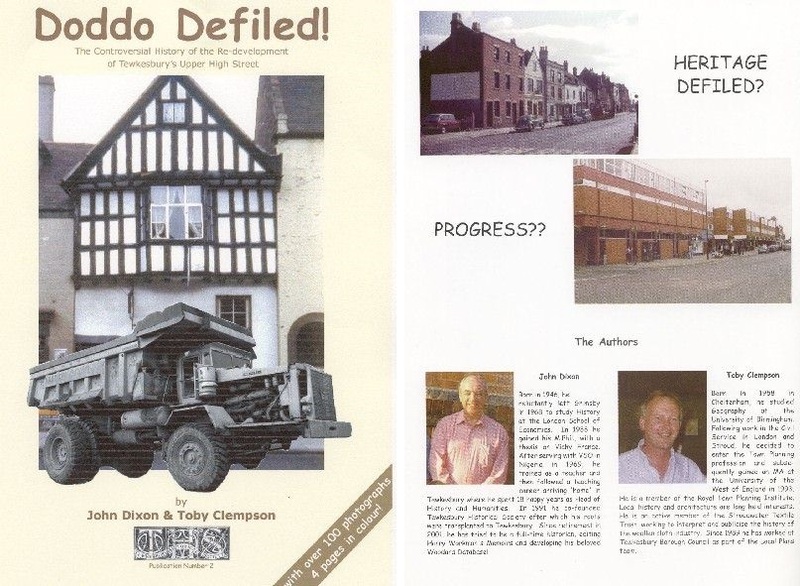 Toby analyses the reasons why it was felt desirable to demolish a 'historic' part of the town whilst John presents the history of each displaced building and its inhabitants. We have also provided a profile of the leader of the "Progs" who wanted the scheme in the name of 'Progress' and the "Meds" who resisted the scheme in order to preserve our medieval heritage. The plan to demolish the Doddo Restaurant (pronounced locally as"Dodo"!) galvanised local people to form the Civic Society whose aim is to prevent wholesale destruction of the Town's Historical Heritage. To assuage curiosity, we have presented over 100 photographs - with four central pages solely devoted to colour photographs. Just to prove that History has a habit of becoming the future, there is currently debate about "demolishing the Kremlin"! The authors trust that if this scheme takes place it will respect Tewkesbury's heritage and will ensure that, in the same spirit of conservation, the concept of the heritage respects the memory of our Kremlin! If you have any comments upon the content of the book and can add to our knowledge with memories - or more photographs - then please email Johnor telephone on 294262. Toby and John hope that you enjoy reading Doddo Defiled! as much as they enjoyed writing it! The book can be purchased by clicking on How To Buy.